It's a nice afternoon and I have a client that didn't get his materials in the mail. I did a re-print and said I'd drive them down. Car or cycle - cycle - today it was an easy choice. I'm in NO rush so I'm taking roads that I often don't. They're slow and several are gravel. No problem. At about 20 or 30MPH I notice a wobble in the handlebars at mid turn. Odd I think. About two corn fields away I slow to do a right turn onto Nelson road - and was shocked at the wobble in the handlebars. It was a 15 to 20MPH turn and I became instantly aware that the first wobble was not 'just something' - it was a near flat front tire. Slow leak - starting somewhere on the trip. Made it to the first farm house - folks were home and I filled it up. The 10 minute ride to DeKalb was just about as long as the tire would do. To the station and fill it up. To the client and drop off the materials. To the closest cycle dealer to check into fixing the problem - closed. To another cycle dealer - via another station (almost ended up walking it due to being so deflated) - nope - shop guy is gone. Head over to Wal-Mart to purchase a tire pump. Checked the bicycle isle - the long straight pumps - and I'm looking for a compact foot style. Over to automotive - 12v powered, compact pump for 1 buck more than a hand pump. 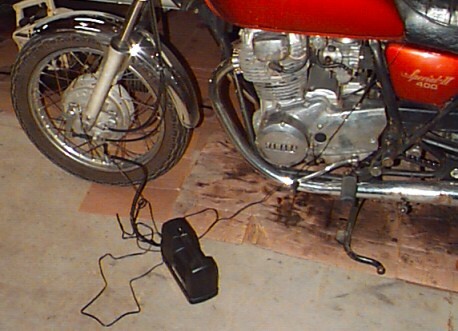 The cycle has a 12v system. Sold. Pick up some alligator clips too (no cig lighter for the pump to plug into). Out to the parking lot and situate the items for the ride home - and of course - fill it up. I'm thinking that pulling the seat to get at the battery every time is a hassle (remove backpack mounted to seat, remove seat, connect compressor, put everything back). I end up cutting the positive wire's alligator clip off and I connected (after first cutting off the cigarette plug and putting on the alligator clips) it to the battery's positive post (handy uses for the Gerber Multi-Plier). This way I didn't have to remove the seat or back pack - saving time and hassle. Head over towards Sycamore and stop at a station to fill up. Call Dad for backup standby if needed (cell phones are handy). Start out. Go about 8 miles on the station fill (really filled it). Stop - pull out the compressor from the back pack. Connect the air line. Clip the negative wire to a spoke (any metal part of the bike) - flip the switch. About the time it takes to sit at a red light is about all the time I needed for a stop and fill. Six air stops (about every 4 miles) - home. All considering - a quite enjoyable evening. Tomorrow I'll dismount the wheel and take it for repair (replace the tube). NOW FOR YOU SUPERSTITIOUS TYPES - THE REASON FOR THIS EVENT: On this trip the cycle turned past 13,000 miles.